Are you looking for Book Shops located at Barasat? Do you want to know where to contact for purchasing Books of Ananda Publishers in Barasat or nearby Madhyamgram, Hridaypur, Duttapukur area of North 24-Parganas? Let me tell you that there is no need to go far from your home; because Ananda Book Store has been established at Barasat in August 2012. Ananda Book Publihshers is the renowned name when it comes to Book Publishing. So many of Ananda Book Stores has been established at different locations of Kolkata (West Bengal) like Dunlop, Uttarpara, Suri, Howrah etc and now Ananda Book Store is also launched at Barasat. The Ananda Book Shop of Barasat was inaugurated by eminent author Sirshendu Mukhopadhyay on 9th August 2012 at 4pm. Those who want to know where Ananda Book Shop in Barasat is; are requested to come to K.K. Mitra Road and beside the Adi Paul Brothers shop you will get to see the Ananda Book Store of Barasat. • Address of Ananda Book Store Barasat: - 6, K.K. Mitra Road, Barasat, Kolkata, North 24-Parganas, West Bengal. • Phone contact number of Ananda Book Store Barasat Kolkata is 9874771777. Ananda Book Shop of Barasat has the stock of every book that was published by Ananda Book Publishers. So, from now onwards, you need not to visit Kolkata for purchasing the books of Ananda Publishers. Are you looking for reliable Book Stores nearby Belgharia, Dakshineswar, Ariadaha, Tobin Road, Sinthi More area of Ananda Book Publishers? On 12th January 2012 Ananda Publishers has opened their new Book Store at Dunlop on B.T. Road. Swami Aatmapriyanandaji Maharaj of Vivekananda University Belur Math has inaugurated the Dunlop Ananda Book Showroom and from now on people can get their favorite books at their own area. Address of Ananda Book Store Dunlop: 3 B.T. Road, Opposite of 9A Bus Stand, Dunlop, Kolkata-56. Phone number of Ananda Book Shop Dunlop Kolkata: 9433365391. You all are requested to visit Ananda Book Showroom of Dunlop to get any books published by Ananda Publishers at exact price. Shocked? Don’t get shocked by the title Naked Gandhi; read the Book of Netaji Subas Chandra Bose’s researcher Sri Alokkrishna Chakraborty. Sri Alok Krishna Chakraborty has written a Book named ‘Gandhiji Apokarmo’ (Gandhi ji’s Bad works) and the Book Gandhiji Apokarmo is available at Kolkata Book Fair 2011 (Stall No.524 / 476) and also can be collected from Dey Book Store College Street Kolkata or from Nath Brothers Kolkata or from Madhusudan Book stores Kolkata Book shops. 1. Division of India and Gandhi ji’s hand on. 8. Gandhi Ji sleeping Naked with the females during the night. One should buy the Book Naked Ganghi or Gandhiji Kukarmo to know the personal secret life of Gandhi Ji. On the auspicious occasion of 150th Birth Anniversary of Rabindranath Tagore Pratikshan Books Publishers, Kolkata is presenting the most prestigious publications in Rabindranath Tagore’s 150th Birth Anniversary and that is Rabindra Chitravali in four volumes in which all the paintings of Rabindranath Tagore are available. More than 200 Rabindranath Tagore’s paintings and doodles. The Rabindra Chitravali of Tagore where acclaimed art historian R Siva Kumar has written texts will be available in Kolkata Book Market from 2011 May. But before that all of us can Buy Rabindra Chitravali (Paintings of Rabindranath Tagore) from 2011 Kolkata Book Fair’s stall no 303 or from online www.pratikshanbooks.com website. The Price of Rabindra Chitravali is Rs.20000/- but if pre-booked then the price of Rabindra Chitravali (Paintings of Rabindranath) will be only Rs.10000/-. For further details on Rabindranath Tagore’s Paintings please visit www.pratikshanbooks.com website. 35th Kolkata Book Fair, biggest Event of Kolkata, is going to start from 26-January-2011 in Kolkata's Milan Mela Complex. Not only India, overseas countries like Germany, South Africa, Sweden, Italy, Spain Mongolia, China, Great Britain and USA will participate in 2011 Kolkata Book Fair. Previously in Kolkata the Book Fair was held at Kolkata Maidan Ground. Due to the order of government to prevent Kolkata Maidan from pollution; 2011 Kolkata Book Fair is going to held at Milan Mela Complex, beside Science City, E.M. Bypass. Milan Mela Complex has 75,330 sq. mt. area. Visit Kolkata Book Fair 2011 at Milan Mela Complex, Kolkata by Bus Route or by Cars. Since, Milan Mela is located beside Science City on E.M. Bypass it's easy to reach from Kolkata places. The Book Fair Association has announces to ply few Buses especially for Kolkata 2011 Book Fair Ground from different locations of Kolkata. Mexico was the theme country of 2010 Kolkata Book Fair; but this time 2011 Kolkata Book Fair Theme is USA (United States). The Theme Song of 2011 Kolkata Book Fair is 'Oi Dakse boi, jeno patai patai likha onek kotha'. • 2011 Kolkata Book Fair Closing Date: 6th February 2011. Amongst many popular Book Stores in Kolkata at College Street and Beniatola Lane; Ruby Publishers, Kolkata is one of them, having good good-will to the Book shoppers of Kolkata. Ruby Book Shop & Publishers, Kolkata deals with all kind of educational and story books at cheap Book price in Kolkata and also known for Book publishing centre in Kolkata. Latest edition School Test Papers, Suggestions of Madhyamik Exam, latest suggestions for HS Exam and College graduation Books along with Engineering / Medical Books are available at Ruby Book Showroom, Kolkata that opens all working days except Sunday between 10am to 7pm. Kolkata Book Market of College Street is the cheap book market in Kolkata and across West Bengal. There are so many of popular Book Publishers in Kolkata and Book Shops in Kolkata Book market on College Street, Beniatola Lane, Shyamacharan Dey Street area. For the purpose of giving information to the Book Buyers of Kolkata and Book lovers; we gather some well-known Kolkata Book Shop name, address and phone number mentioned below from where Book buyers can buy every types of latest edition book at cheap Book price in Kolkata. Santra Publication Pvt. Ltd., Kolkata is a famous Book Publishers in Kolkata and the best Book Sellers in Kolkata of Life Science Books in Class-X and Class-IX standard. Prantik Book Publishers & Store, Kolkata is very much familiar to all students for providing exclusive educational books, guide-books, test papers, sample notes and suggestions of different subjects from primary to post-graduation level of various board (English or Bengali medium). Prantik Book Showroom, Kolkata opens between 10:30am to 7:30pm on all working days except Sundays and Holidays and don’t accept Credit/Debit Cards while payment. Madhyamik Bangla Byakaran Nirmity O Rachana, Adhunik Bangla Byakaron O Rachana, English Grammar and Composition, Bharat O Adhunik Biswer Itihas, Madhyamik Bhugol, Sadharan Bigyan Parichoy, Madhyamik Test Paper 2011-2012, HS Test Paper 2011-2012, Engineering Books etc. College Street is known as Kolkata’s Book Market and you will found so many Book Shops beside College Street that sell Books at cheap price. Forward Book Publishers & Store, Kolkata is one of them that sale every type of Books and also publish books in Kolkata. Kolkata Book Publishers, Forward Book Shop, College Street, opens all working days between 10:30am to 7pm and don’t accept Credit/Debit Cards for payment. Are you looking for Best Book Shops in Kolkata Market? 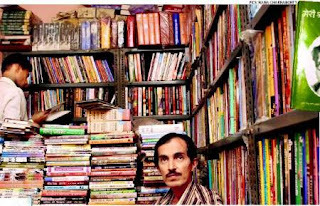 Do you want to know Good Book Stores in College Street area of Kolkata? B.B. Kundu Grandsons, Kolkata is one of the best Book Shops in Kolkata having wide range of latest edition Books of School Syllabus, College Syllabus and Engineering/Medical Books. Kalimata Pustakalaya, Kolkata is the best Book Shops in Kolkata situated at College Street Area. Having huge stock of various books of Kalimata Pustakalaya Book Shop, Kolkata attracts the Book-Lovers of Kolkata. Kalimata Pustakalaya Book Store, Kolkata has the stock of General Study Books, Madhyamik & H.S. English Grammar Book, Preliminary Examination Suggestions Notes, Polytechnic Entrance Exam JEXPO / POLY-40 Guide Books, Model Practice Test Papers, WB-JEE Study Materials, AIEEE & JEE MCQ Short Answer type questions, Engineering Books, Medical Books, Biological Science Books of UG/PG Degree Courses and many other latest edition Books. Dey Book Concern, Kolkata is the best Book Shops in Kolkata situated on Shyamacharan De Street Area. 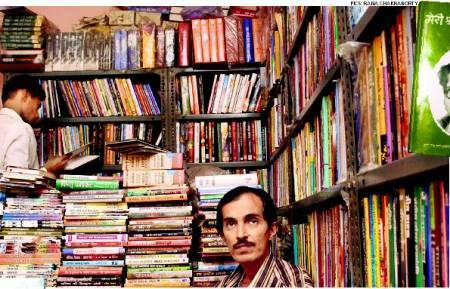 Having huge stock of various books of Dey Book Concern Book Shop, Kolkata attracts the Book-Lovers of Kolkata. Dey Book Concern Book Store, Kolkata has the stock of General Study Books, Madhyamik & H.S. English Grammar Book, Preliminary Examination Suggestions Notes, Polytechnic Entrance Exam JEXPO / POLY-40 Guide Books, Model Practice Test Papers, WB-JEE Study Materials, Engineering Books, Medical Books, Biological Science Books of UG/PG Degree Courses and many other latest edition Books. Nirmala Library, Kolkata is the best Book Shops in Kolkata situated on Scott Lane of College Street Area. Having huge stock of various books of Nirmala Library Book Shop, Kolkata attracts the Book-Lovers of Kolkata. Nirmala Library Book Store, Kolkata has the stock of General Study Books, Madhyamik & H.S. English Grammar Book, Preliminary Examination Suggestions Notes, Polytechnic Entrance Exam JEXPO / POLY-40 Guide Books, Model Practice Test Papers, WB-JEE Study Materials, Engineering Books, Medical Books, Biological Science Books of UG/PG Degree Courses and many other latest edition Books. Deb Prakasan, Kolkata is the best Book Shops in Kolkata located on College Row of College Street Area. Having huge stock of various books of Deb Prakasan Book Shop, Kolkata attracts the Book-Lovers of Kolkata. Deb Prakasan Book Store, Kolkata has the stock of General Study Books, Madhyamik & H.S. English Grammar Book, Preliminary Examination Suggestions Notes, Polytechnic Entrance Exam JEXPO / POLY-40 Guide Books, Model Practice Test Papers, WB-JEE Study Materials, Engineering Books, Medical Books and many other latest edition Books. Tulsi Prakasani, Kolkata is the best Book Shops in Kolkata locates on Ramanath Majumdar Street. Having huge stock of various books of Tulsi Prakasani Book Shop, Kolkata attracts the Book-Lovers of Kolkata. Tulsi Prakasani Book Store, Kolkata has the stock of General Study Books, Madhyamik & H.S. English Grammar Book, Preliminary Examination Suggestions Notes, Polytechnic Entrance Exam JEXPO / POLY-40 Guide Books, Model Practice Test Papers, WB-JEE Study Materials, Engineering Books, Medical Books and many other latest edition Books.